Doug & Kathie Whitehouse are REALTORS in Michigan. Doug is the 2005 President of the Michigan Association of REALTORS and Kathie is the 2005 Member of the Year for the State of Michigan's Women's Council of REALTORS. They hold the REALTOR Alumni of The University of Michigan (RAM), Certified Residential Specialist (CRS), Certified Internet Real Estate Professional (e-Pro), Certified Residential Broker (CRB), Performance Management Network (PMN) designations. The Whitehouse's are Allen F. Hainge CyberStars; an elite group of REALTORS who have been national recognition as experts in using technology to successfully market real estate. Doug was recognized as REALTOR of the Year by his local association in 1994-1995 and has served as a Director of several local associations and was Chairman of the Board of the Regional Multiple Listing Service. 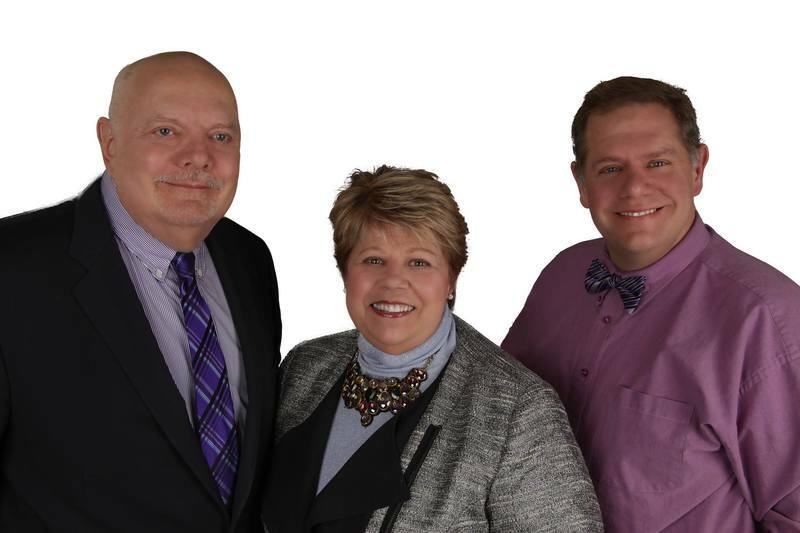 Doug and Kathie are part of Berkshire Hathaway HomeServices HWWB, REALTORS which services the South East Michigan area around Detroit. They specialize in Oakland, Macomb and Wayne counties as well as the lakes area. Oakland County, located just minutes north of Detroit features loads of great lakefront homes and with all of the major automobile manufacturer headquartered locally it is considered one of the most upscale locations in the country to live. Marketing homes of high quality requires the use of latest in technology and exceptional creative skills to communicate the quality of lifestyle afforded by homes in the surrounding area. Before becoming REALTORS Doug and Kathie were part of a food processing company know as Whitehouse Products, which created the non dairy industry by creating the first commercially available non dairy whipped topping made from soybeans. 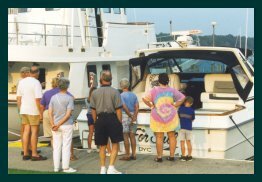 During their leisure time they enjoy boating on all of the Great Lakes from Chicago to the Canadian North Channel to Put-In-Bay in Lake Erie. If not on their boat you might see them on a Harley enjoying a ride with either of their children on their motorcycles. Kathie & I have been boating for many years. We have had several boats. Our present boat is a 39' SeaRay Express Crusier that we keep at the Detroit Yacht Club. 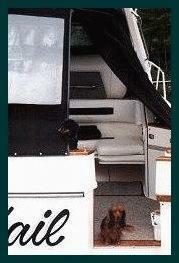 We use it as a summer home and have enjoyed the boating friends we have made over the years. 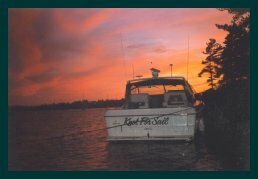 The best thing I can say about a boat and being on the water is that is an important change of pace that lets us unwind from the pressures of a seven day a week profession. Our boat is named "Knot For Sail". Oh, it's our boat mates. Meet Lady (the one with the gray face), she's the mother of Rocky (in the middle) and finally there is PC (short for Penelope Candace). 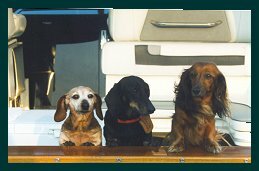 These three think the boat belongs to them and that we dock aft-in so that they can be entertained and petted by the folks walking the docks. 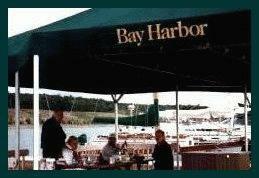 This picture was taken at Bay Harbor Marina in Harbor Spring, Michigan, in the summer on our annual trip north. Another shot of our travel companions, two of our three miniature dachshunds. The black one is Rocky, short for Rodchester. Rocky is the son of the missing dachshund by the name of Lady (Lady Megan). The third one is PC ( Penny Candy, Penelope Candace) is fast just like a computer and was brought back from Germany by our daughter Samantha while she was studying at the University of Freiburg i.br. The three dogs enjoy boating as much as we do. This was taken at the French River inlet to Georgian Bay in Canada. The area is a great spot to anchor a boat away from civilization. The area features numerous small rapids and channels leading into the bay and is a loads of fun to take a dingy and explor the rapids. 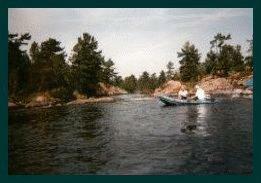 The photo shows Doug & Kathie headed up the river towards a small rapids. 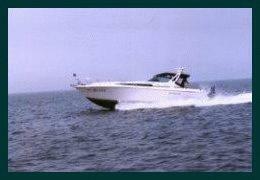 A picture of our boat underway on Lake Huron. The real reason for boating. What better way to end a day than sitting on the back of a boat with special friends while watching the sun set over the Great Lakes of Michigan. 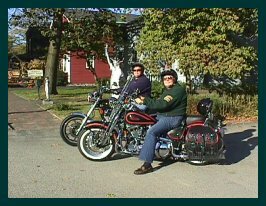 In his spare time Doug enjoys a ride through Franklin "Home to the historic Franklin Cider Mill".